It seems like a very long time ago that I did Project 4 and separated some images into their shapes, colour and texture. 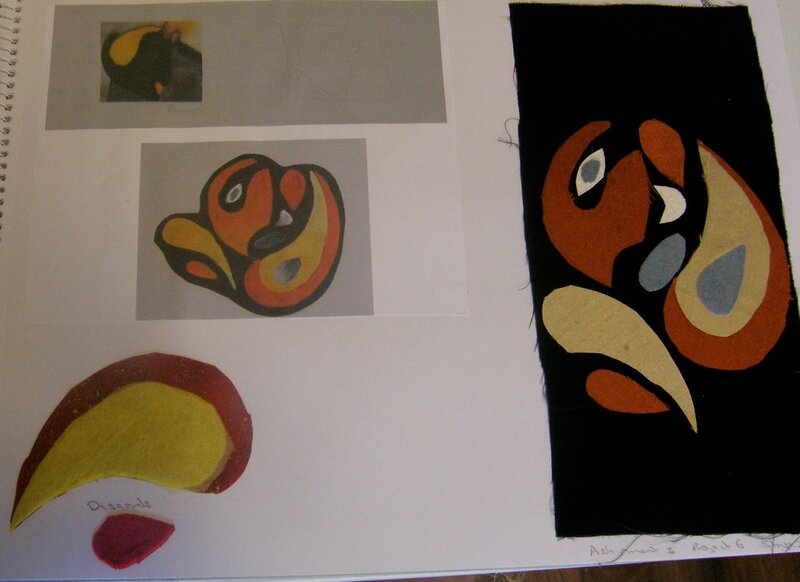 When I was reviewing my work for the first stage of Project 10, I came across the penguin image that I used and the shapes I separated out from this in Project 4 that I further developed into applique samples in Project 6. 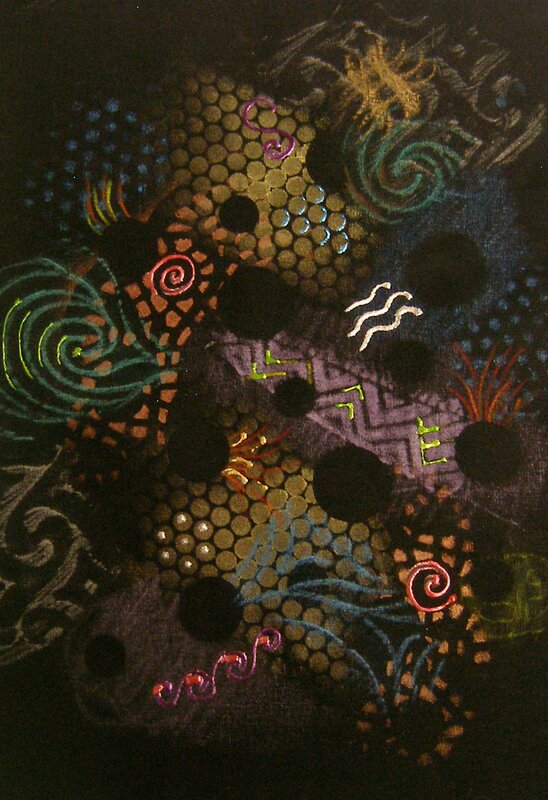 When reviewing my work I had just been on a workshop on Creative Colour and one of the samples I produced was this; a mixture of Lumiere paints, Liquid Pearls and Shiva Paintstiks using stencilling and rubbing techniques. 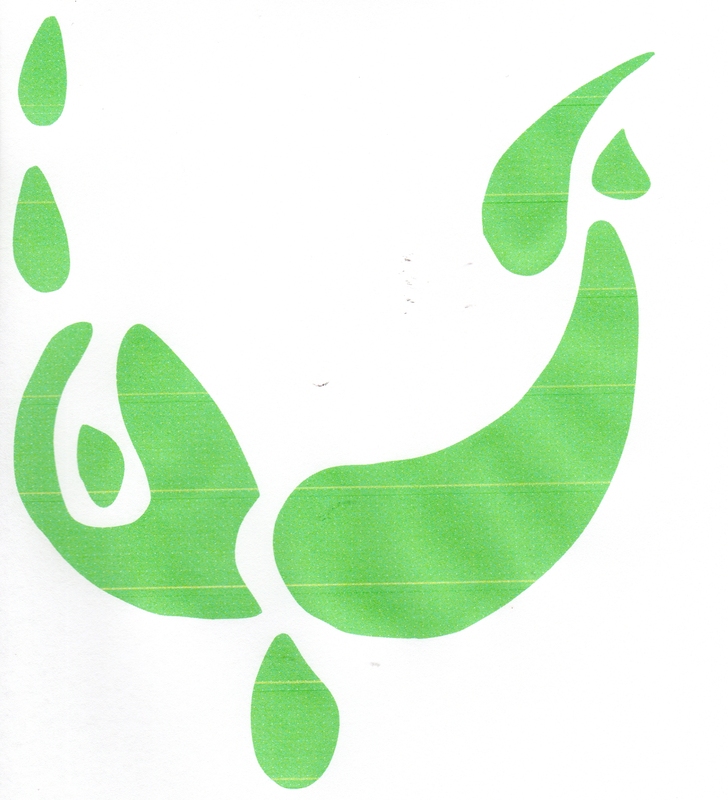 I decided that the shapes from the penguin image could be reformed to make a necklace so I traced the shapes, scanned them and then played around with their positioning. I added copper shim circles to the fabric sample and stitched these in place. 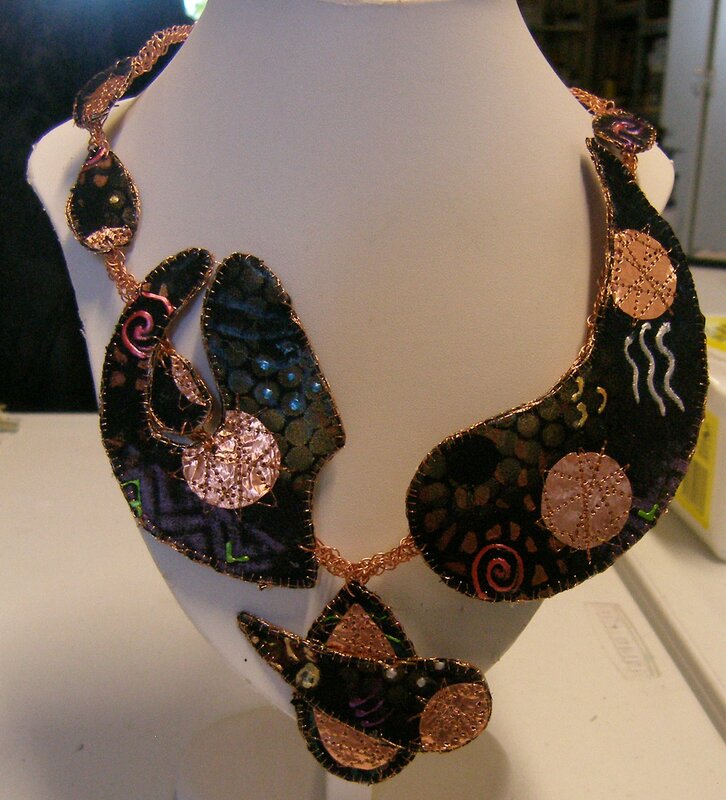 Then I traced over the necklace shapes onto clear plastic and positioned the shapes onto the fabric to get the layout of the copper and colours in the best places. After cutting the pieces I backed them with black fabric and made a twisted cord which I buttonhole stitched around the edge of each shape. Finally I made a loosely woven Kumihimo braid in copper wire and stitched the pieces into place. I changed the position of one of the pieces in the final process for a better result and to give more emphasis to the focal point. I am pleased with this as an example of how an image can be developed by separating out the shapes and rearranging them to create a completely new composition. It was also good to use a sample from a workshop and produce a finished item even though I had no end product in mind when I initially made the sample.